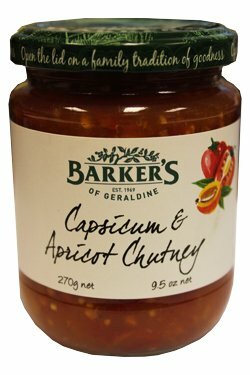 The combination of rich red capsicum and succulent golden apricots makes this sweet and succulent. Barker’s was established in 1969 in Geraldine. The family run business have years of experience in fruit preserves and this shines through with their great tasting and high quality products. Always trying their hardest and always choosing first to source their fruits from New Zealand fruit growers and only use the very best and finest produce. Containing no artificial sweeteners or colours. Red Capsicum (48%), Apricots (31%) (contains Sulphites), Sugar, Vinegar, Thickener (E1442 from Maize), Salt, Garlic, Chilli, Black Pepper, Natural Flavour.